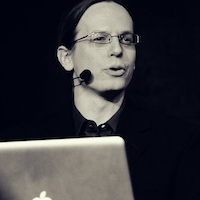 Markus Montola (PhD) is a Helsinki-based game designer and game scholar with 15 years of experience working with location-based mobile games. Before working on The Walking Dead: Our World, he was a lead designer of the GDC Online Innovation Award-winning location-based MMORPG Shadow Cities, as well as a lead designer of several smaller mobile titles. As a games scholar, he has written and edited half a dozen books on games, most notably Pervasive Games: Theory and Design (2009).